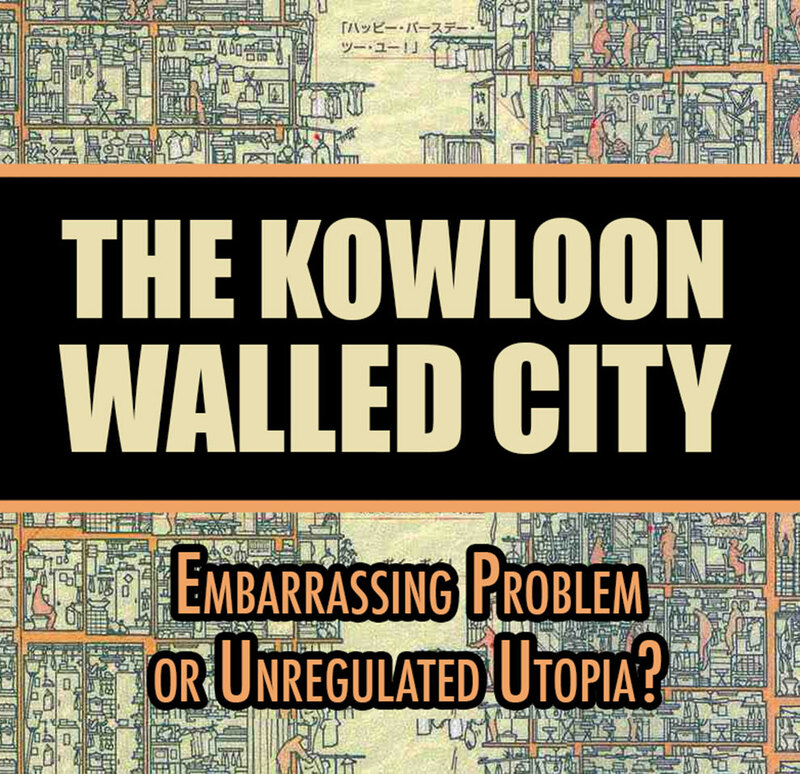 The Kowloon Walled City: Embarrassing Problem or Unregulated Utopia? Since it’s complete destruction by the government in 1994, the Kowloon Walled City has attracted a fair amount of interest over the years as either an embarrassing problem of crime and cramped living conditions – or as an intriguing example of a population that lived without rulers and their regulations. Existing within the much larger city of Hong Kong, Kowloon was a complex society of around 33,000 – 50,000 people living out their lives in a roughly 6.4 acre area. It was one of the most densely populated places in the world, and it somehow all worked. Unfortunately, I really didn’t become familiar with Kowloon until recently. As an artist, I sometimes look for inspiring images or interesting subject matter online in order to help spur a little creativity. This particular search (which had something to do with unique places in the world), somehow brought me to Kowloon. I first saw the photo of Kowloon from the air, with it’s roughly 14 story buildings crammed together as if it were almost one huge block – except with open spaces here and there, and varying levels to the top floors. Meanwhile, within the city itself, there were walkways, rooms, hallways, passageways, and streets where daylight hadn’t shone for decades. Without a doubt, it was chaotic in appearance. But it was also a testament to architecture being transformed and altered over time to meet the many needs of it’s occupants (similar to what was portrayed in the iconic architectural look seen within the film “Bladerunner”). Kowloon’s near anarchist society came about as a result of a dispute between Great Britain and China. Neither could figure out who owned the space on which Kowloon sat, so it really didn’t have much of a government presence. As a result, thousands of people saw opportunity to be had here, free from harsh or burdensome red-tape, fees and fines. For example, while there were many dentists which worked out of Kowloon, there were also schools, shops, places to eat and socialize, rooftop gardens, areas for children to play, places of worship, small manufacturing facilities and more. All unregulated. To be fair, Kowloon was not without problems. There were drugs and prostitution, as well as organized crime – all problems that exist within any city, even highly controlled ones. And there was the problem with lack of space as well, with many families having to share rooms, or spaces having multiple uses throughout the day. Some people even had to haul water from various water sources located within the city. But it was far from being a slum. Many people who lived here took pride in their homes and the businesses they ran, and liked the close-knit communities they formed with their neighbors. And when you consider all the thousands of men, women and children that lived here, with many fondly reminiscing years later about their experiences of growing up there, it’s pretty remarkable. No, this society didn’t turn into some kind of barbaric Mad Max scenario, or implode on itself from some lack of a “guiding hand of progress”. In the end, it was doomed by a government that seemed to have felt embarrassed that such a place existed outside of their control. People were forcibly evicted (although compensated, many simply didn’t want to leave their homes), and the entire place was razed and turned into a park. What do you think? Would a free society be able to function very well without central planning, eminent domain or a controlling force at work? Would a place like Kowloon work in other areas of the world? If Kowloon had more space, and the people who lived here were able to have access to free market resources outside the city, how would it possibly have been different? What libertarian/voluntaryist lessons can be taken from Kowloon in regards to decentralization, urban planning and architecture that is able to more effectively meet the needs of people? This entry was posted in Uncategorized and tagged architecture, Bladerunner, central planning, close-knit communities, decentralization, eminent domain, Free Market, free society, government, kowloon, kowloon walled city, Libertarian, Mad Max, meeting the needs of people, society, unique places, unique places in the world, urban planning, Voluntaryist. Bookmark the permalink.